Giveaway is now closed, thank you! I can't believe I've reached over a 1000 followers!! Seriously I'm blushing over here, you guys are the best!! Just be sure to comment if you become a follower & share on Facebook. Even if you are already a follower please comment again so you get the extra entry! Here are the goodies I will be giving away, yes there are 6 prizes I hope you love them! I think I've caught the vinyl cutting bug. Okay so there you have it! I'm thinking I will close this giveaway on Wednesday the 23rd. Oh and if you don't win the Date Night Vinyl I am selling a few sets in My Etsy store and shipping is free! Well I better get busy, I have to pack as I'm running away to SLC Utah on Friday with my dear friend Nanette (both of us kid free) and yes Ikea is on the shopping list! Good Luck and Thanks so much for reading my little ol' blog! 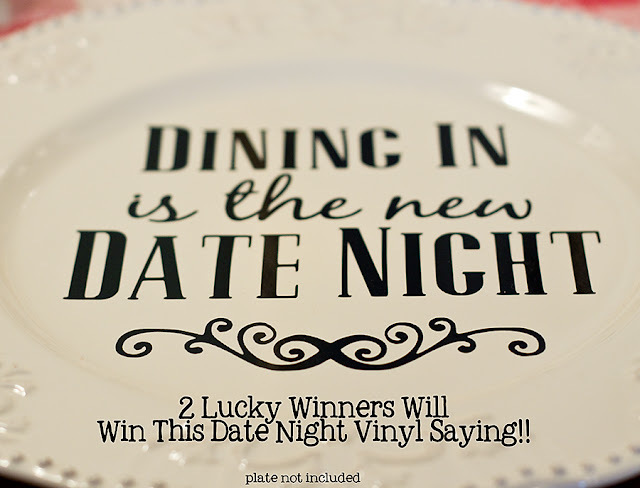 All these vinyl things are a lot of fun, and so versatile! Thanks for giving such cute things away! Congrats on 1000 followers, that is pretty amazing! Congrats on your 1000 followers. Thank you for the great giveaway. 1000 followers.. I can only dream of 1000!!! following! Was I serioulsy never a follower before??? Just signed up. Excited about the giveaway! Happy Utah (and kid free) time to you. Don't forget to hit Cafe Rio and maybe some Jamba Juice, too! Love the goods Rachel. I need to payouts attention I think! Very Cute! I want one! Cool stuff; I hope I win. Cool giveaway! Congratulations on 1000 followers! I finally had my baby a week overdue! Have fun in my neck of the woods and at Ikea! Pick me pick me I never win!!! I am already a follower so I get to enter again!!! SO PICK MEEEEE!!! I'm really hoping to win! Oh cute! I will keep my fingers crossed! Um....I am not on FB and don't know how to follow...so it is just this comment! 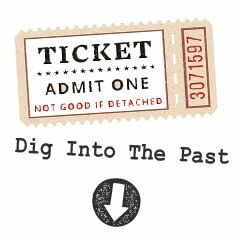 I'm so last decade! ha, One entry for me. Thx! Okay I commented but it didn't work so here is another try. (it must be the blond highlights I got) I love this it turned out so cute. once again you pulled off another awesome project. How do you do it? I also posted on facebook as well. I sure hope that I win!! Congrats, Rachel! You know your blog rocks! You know I have been a follower since I came to blogland....will always continue to be a follower. Congratulations!!! And your new header is really nice! I am in love with the plates! So pretty! Here goes to finger's crossed! Cute stuff chickadee!!!! You are amazing!!! OH and congrats on the .com, that's awesome. Fine I follow you. . .finally. Only because it helps me to win, lol. 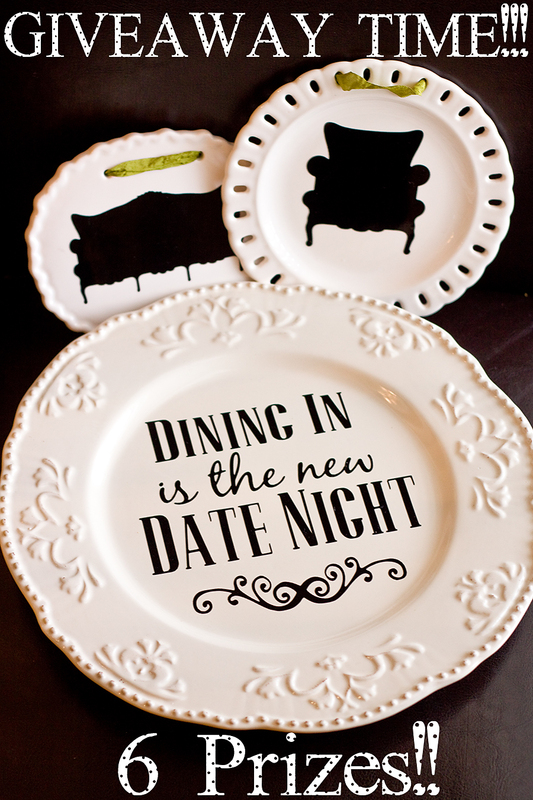 i want a date plate! Well done on the 1000 followers! May there be many more to come! I am sharing this on my facebook! Oh, and I'm a follower too! Congratulaions on being well over 1000 now! I love reading your blog!! And those vinyls are so cute! Rachel - How DO you find the time? I am posting to my facebook! Following and will post to facebook!! Super cute stuff! Congratz on 1000 followers. I love the vinyl decals. I'm a follower thru Google. Beautiful Blog. I found you from Sugardoodle. I love your CTR Towels. Such a fun gift! I am now a follower. I look forward to browsing through more of your posts. Congrats on reaching 1000 followers! 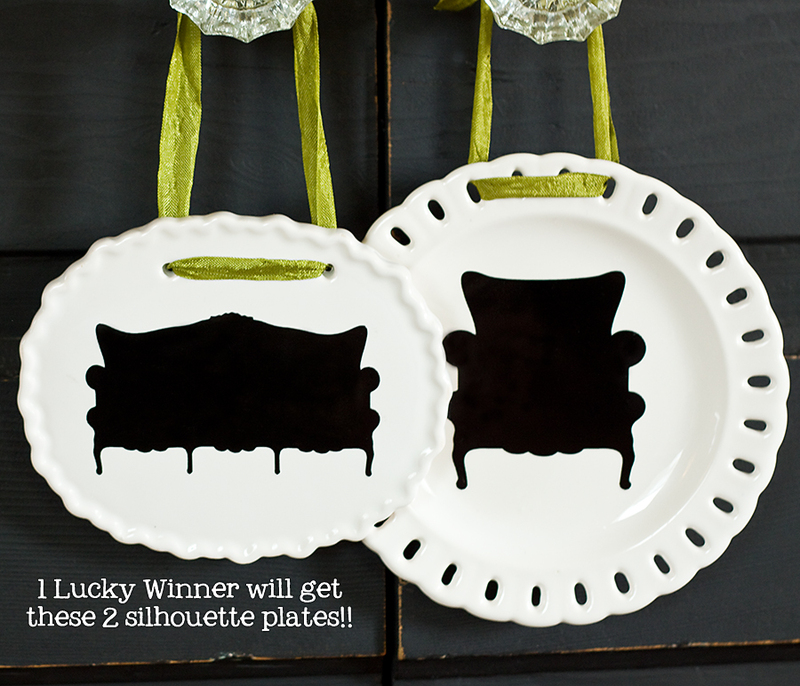 I would love to win your fabulous giveaway! These are so cute! I hope I win one of these. 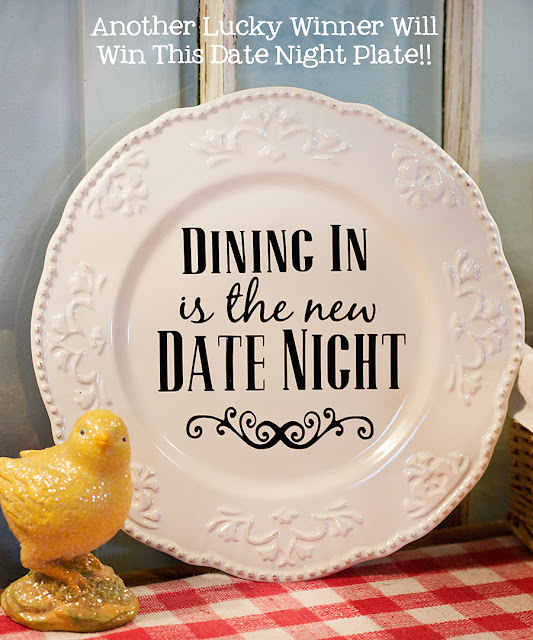 Love the Date Night Plate! You are so creative! Congrats on the 1,000 followers! I love the giveaways - fingers crossed. SOOOO cute - I need to put plates on my walls and follow the trend! I just found your blog because a friend of mine follows you. O M Heck! Your stuff is so cute! I love your blog! I'm following you in Google, on Etsy, and on FaceBook. Consider me hooked! I love these plates. I am joining as a follower. Would love a chance to win these. I LOVE that saying!! It is so true!!! I would love to win them! !